Intuitive Defensive® Shooting: The Origin & Early Development The Intuitive Defensive® Shooting program is an intuitive shooting program designed to help the student be more efficient in the context of a dynamic critical incident. “CFS” is the flagship program of I.C.E. Training Company and the cornerstone of all the firearms instruction that I do. (CFS has a sister program, “Dynamic Focus™ Shooting”, that is taught by the same instructors and available as part of the curriculum at all Gander Mountain Academy locations around the United States.) Many people have asked me about the name over the years, sometimes bluntly wondering how a guy who has never been in combat could possibly think it was a legitimate name. Well, they have a point. The initial idea was that in “combat” you “focus” on the threat….and we were primarily teaching people to focus on the threat while they were shooting. At the time, I thought it was brilliant. As the years went by, I often said that I should have used “Dynamic Focus” as the name, as you tend to focus on the important stimuli during any dynamic event…. And, in truth, we teach people to (dynamically) shift their focus to their sights when they need to in order to hit a more challenging target. Over the years, we have used the names interchangeably for various audiences and contracts, but the brand has always been, and will always be, CFS. In September 2013, as I write this, we are celebrating the 10th Anniversary of the program. CFS was first taught in the fall of 2003 at the Valhalla Training Center (VTC). When we first started teaching it, it was much less of a program than it is now. Like many new schools, we didn’t really have a curriculum of our own, just a collection of principles, techniques, drills and concepts that were largely picked up along the way, often modified and not very well organized. It wasn’t until 2005 -06 that CFS really started to look like what it is today. In 2003, it was just the name of the shooting style we taught in our classes. In fact, in the very first advertisements for VTC, it was listed as the “Intuitive Defensive™ Technique” as part of our defensive pistol courses and recreational events. Even as late as 2005, very few pure “Intuitive Defensive Shooting” courses were being run, but CFS was an inherent portion of all our programs (including concealed carry, executive protection and extreme close quarters tactics open enrollment classes). 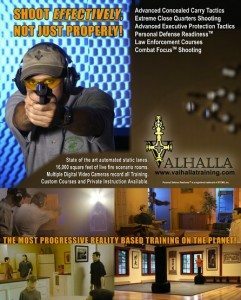 To understand the early development and evolution of CFS, it is important to understand exactly what Valhalla Training Center was. The story of how I ended up running Valhalla has been told many times before… suffice to say that it was a huge opportunity that I wasn’t going to pass up and certainly felt up to the challenge of. But, if you had asked me in September of 2002 if I would be running counter ambush training for a full company of US Special Forces Soldiers in September of 2004 and certifying instructors assigned to Navy SEAL Qualification Training to teach my program little more than a year after that, I would’ve laughed at you. For one thing, I didn’t have my own program to teach them. VTC was a reality based training center, no longer in operation, that I ran from 2003 until the end of 2007. During its existence, it was recognized as one of the most advanced facilities in the world. It was even identified in a 400+ page white paper as the most advanced private sector close quarters training facility available to the US Military. In addition to standard ranges, we had a 360 degree live fire scenario and simulation area that allowed us to test the efficacy of our training programs and our student’s ability to apply the skills that we were teaching them in a realistic, emotionally powerful setting. The scenario ranges featured reactive and interactive targets, sound & light effects and could be used for non-lethal scenario training with expert role-players. While the focus was on personal defense and high-level military special operations training (regular clients included US Army Special Forces and Naval Special Warfare units), we were a sister company to a five star resort as well. That meant that we could literally have 60 Green Berets on property doing pre-deployment training in Extreme Close Quarters Counter Ambush one day and a team-building event for a multi-national luxury goods company the next. While the opportunity to piggyback on the business of the resort while running training courses for civilians was part of the original business plan, the development of the programs for the military was unanticipated. In late 2003, I was contacted by members of the 10th Group stationed at Ft. Carson who wanted to rent the facility to conduct their own training. This was a pivotal moment. The business plan never called for renting the facility and I was particularly interested in avoiding the mistakes that I had seen made in military & law enforcement training. At the same time, we were at war and I didn’t want to ignore the opportunity to support the efforts of our soldiers to get prepared. Furthermore, I wasn’t interested in building a career as a host for great training, I wanted to conduct great training. I rolled the dice and told them that we didn’t rent the building, we provided training. I challenged them to send a couple of representatives to one of our Extreme Close Quarters Tactics (ECQT) courses, which at the time included a day of Intuitive Defensive® Shooting and two days of combining unarmed combatives with contact shooting in the context of an ambush situation. I committed to them that if they did not find value in the program, I would reconsider renting them the building. They sent two respected members of their unit to the course, which I tailored to include dealing with what happens if a threat grabs the rifle of a soldier moving through a building, requiring a response via unarmed techniques and/or a pistol. Ultimately, the decision was made to take advantage of the unique close quarters training we offered. In addition the ECQT program, our package integrated traditional drills, SFUAC (Special Forces Advanced Urban Combat), Convoy Security and a variety of other components. Ultimately, I was running a Five (18hr) day package as “Extreme Close Quarters Counter Ambush” and it is some of the work that I am proudest of. At the core of those training weeks were the principles that were CFS. During the week, every soldier participated in at least 4hrs of CFS Range Training with their pistol and rifle. Overwhelmingly, the feedback that we got on the value of the CFS approach was very positive. I cannot accurately articulate the pride I felt when I first heard an SF Officer state that the training we had conducted would undoubtedly save lives in an upcoming deployment. Still, it was surpassed by the feeling I had when the first Green Beret told me that the training had saved lives after he got back. That type of training became the real focus of VTC for the majority of the time it was in operation. On non-training days, we also had a fair number of resort guests who took the opportunity to have a “recreational experience” at the facility. That recreational experience, often their first time shooting a handgun, became an outstanding research opportunity for me as a teacher and program developer. I had long been frustrated with the status quo in defensive firearms training. So much so, that while I sought out as many learning opportunities as I could, attended classes and picked the brains of the leaders in the industry, I had concurrently been developing my own ideas and approaches based on the observation of actual defensive shootings, the behavior of people in training scenarios and research into how the brain and body work together under the stress of a fight. As early as the mid-1990’s I was working to develop a more efficient approach to defensive shooting. I had the great fortune to have met and worked with Hector Martinez, a United States Marine with experience in the first Gulf War who was teaching at the Protective Services school (PSD) at Ft. McClellan. He was an innovative trainer with a passion for making things as realistic as possible for those going through the PSD School, where he covered weapons & tactics. “Marty” and I spent many hundreds of hours on a variety of ranges over the years. In fact, it was Marty who originally developed the Figure 8 Drill for teaching realistic counter ambush response to protection teams. He was also the first instructor to indoctrinate me to into using the command “up!” on live fire ranges. Eventually, Marty took a job teaching at FLETC and, unfortunately, we lost him too soon. The influence that he had on the way I teach can still be seen today. I entered the firearms industry in the late ‘90s and, while still working in law enforcement, began teaching on my own or for various companies and writing for industry magazines. In 2001, I had my first “green light” to write about absolutely whatever I wanted in a national publication, S.W.A.T. Magazine gave me my own column and I penned an article entitled “Qualification Isn’t Training”, in which I condemned quite a few common practices and advocated a few potential improvements for the reader that wanted to draw a stronger correlation between their performance during training and practice sessions, and their ability to apply their skill in a real fight. That was 2001. Even by then, it was clear to many of us in the industry that the things which had overwhelmingly been taught in defensive handgun courses during the preceding few decades were way off. The advent of the “dash-camera” era in law enforcement and the much more frequent use of high quality security cameras was revealing a huge disparity between the range and competition success of the “Modern Technique”, and performance during actual defensive shootings. Despite 30+ years of dogmatic teaching by many excellent instructors and academies, there was no evidence showing that the techniques being taught were actually being used on the street. This meant that those forced to suddenly defend themselves from violence were essentially improvising their responses. What we were seeing in the videos looked nothing like what we were seeing on the training ranges. Observations in Reality Based Scenario Training, which involved high level simulation (as we were doing at VTC) or role players and training guns that used marking cartridges, were revealing how these improvisations came to be. Around the same time, I was heavily influenced by the research of Tony Blauer into the importance of understanding how the body’s natural reactions to being attacked must be integrated into unarmed training in order to increase efficiency. In that world, martial artists had long been criticized for the fact that few of the choreographed and flowery techniques were ever used in actual personal defense events. As best selling author (and authority on combat mindset) Lt. Col Grossman has said, Defense with a Handgun is the American Martial Art… and we were doing the same thing on our side of the fence. Our martial art was full of overly mechanical choreographed theory that only worked well at the range-dojo. Reality Based Training (then still a very young part of the industry) and Reality (via more and more common video taped shootings) were showing us what we needed to do. My approach to teaching defensive shooting was becoming a lot more about emulating and refining what people were doing in the absence of training (or in spite of poor training) in actual fights and a lot less about traditional target shooting and the things that helped people perform well on objectively scored range drills. In fact, in my first book, I said that CFS was more recognized than developed. That gets us back to VTC and our recreational clients. Over the years, I was pushing the envelope on teaching people to develop defensive shooting skills more efficiently. In the 1990’s I became a big believer in unsighted shooting for the majority of defensive situations and I would work that into my courses relatively quickly. But, I was still starting students out with sighted fire. Except for some very extreme close quarters situations, I avoided the term “point shooting” and never believed that it was a good idea to teach shooting “from the hip” in a partially extended position. While this looked great in 1950’s gangster movies, it didn’t seem to make much sense in a gun fight. “Point Shooting” was already a toxic term in professional circles and meant way too many things. Those partially extended positions were only effective in very narrow sets of circumstances and generally just left the gun unsupported and unprotected from threats within arms reach. I teach to either keep the gun in close (as covered in the section on Extreme Close Quarters Shooting) or extend it fully. By extended the gun fully into your line of sight, you can align the gun in the same way that you align your finger when you point or use any other device that relied on hand-eye coordination. At the time, even the most progressive instructors at the highest levels of teaching who believed in the efficacy of unsighted fire at extension in close quarters were teaching sighted fire first. The conventional wisdom was that you had to teach sighted fire to establish good shooting fundamentals and only then could you responsibly teach unsighted fire to a defensive shooting student. I vividly remember a conversation with Harry Humphries, then the Director of GSGI and one of the founding members of SEAL Team VI, in the early 2000’s, during which he assured me that while he and other high end military personnel and people like me who shot (at the time) tens of thousands of rounds a year could certainly get hits without sights in defensive shooting circumstances, novice shooters absolutely needed to be taught “the basics” first… meaning sighted fire. When a guy like Harry says something like that, you tend to believe him. I have no doubt that he absolutely believed it to be true and it is always nice to hear that you are somehow in the same league as an elite Navy SEAL (even if he was just being gracious…). The recreational clientele at VTC allowed me to prove that it simply wasn’t true. When a student comes to me for life & death skill development, I am only so willing to “experiment” with the process. There is no way that I can teach something in a defensive shooting class that I don’t know to be effective. Similarly, there is only so much experimentation that you can do with an experienced shooter because they already bring so much with them to the experiment. Most instructors and schools in the past have only used their own cadre (or trusted experienced students) to develop new drills and attempt to push into new ways of developing skill. Only an irresponsible ‘mad scientist’ approach would allow one to take real students and risk not letting them develop skills in a proven system. Not only is that potentially dangerous, it is disingenuous as well. Let’s not forget that the student is paying me for what he or she believes is the best information I have to keep them alive. The recreational client, however, is another thing entirely. If they leave without any extra holes and a smile on their face, our relationship was a success. I could push the limit of experimentation as long as we were being safe. The staff of VTC and I employed a more and more stripped down training process before taking recreational shooters through “the maze”. The maze was what we called the 360 degree live fire shoot house. This building, originally designed by Tom Forman (the owner of VTC) to be a recreational facility, was approximately 16,000 square feet of fake public and private spaces surrounded by a steal box. We would take the shooters into the maze, which encompassed two floors and with over 2 dozen halls and rooms, and walk behind them as they made their way through with a handgun held in the high compressed ready position. The gun was loaded with frangible rounds and their instructions were very simple “if you see a threat target, shoot it until it goes away or goes down”. The two types of targets we used were mannequins that dropped on hinges and motion sensor triggered pop-out targets that were exposed for about 2 seconds. All the targets were at distances between about 8 and 20 feet. Generally, the mannequins would require 2-5 chest shots to go down, depending on exact placement, the speed of the shots and the specific setting of the hinge. Eventually, the standard drill became to give the students a safety presentation and then let them fire about 15 rounds at a chest sized target 12’ away before taking them into the maze… without ever teaching them to use their sights. In fact, because we were using guns from the training inventory, we experimented with some that didn’t even have sights. These were full size 9mm personal defense guns, which were exactly the kind of gun used by most police officers and chosen by people serious about personal defense. We ran them through three drills: “Extend, Touch, Press”(2-4 reps), “Up!” (2-4 reps) and “Multiple Shot Up!” (as many reps as it took to shoot out the remaining rounds in the magazine), all of which you will read about soon. That was it. We taught them in about 1 minute how to stand and how to hold the gun, gave them less than 10 minutes of live fire practice with 15 rounds fired, and then took them into shooting simulations that were more realistic than most police and military personnel ever get (and hardly any CCW Permit Holder will ever approach.) And they succeeded. They did amazingly well, in fact. Quickly, the results of these experiments turned the way we taught sighted and unsighted fire head over heels for good. There was no more doubt left in my mind: The fundamental defensive shooting skill was Unsighted Fire. Sighted Fire was (and still is) taught as an advanced skill to be used when higher levels of deviation control are needed. In addition to the many hundreds of recreational shooters with no experience at all, we naturally had some shooting enthusiasts come to VTC to run the maze as well. When we did, we would sometimes see stark contrast in the ability of these sometimes very experienced shooters to apply their skills in the maze. We would frequently see people very used to shooting on a target range or in choreographed competition fail to even engage surprise targets that were exposed for only 2 seconds. All too often, the experienced student of the traditional approach to defensive shooting would “double-tap” (fire two very fast shots) a mannequin and then turn away, even though the threat was still there and they hadn’t followed the same simple directions that the novices were given: Shoot until the target goes does or goes away. Of course, those are the exact instructions I would give you if you needed to shoot an actual threat in your home! While I knew we were on the right track, it wasn’t until we had run that experiment hundreds of times that I was ready to tell the world that we had been getting some really important things wrong. It was then that I was just about ready to start writing books about, and doing instructor development for, this new “Intuitive Defensive Shooting” program. It was all happening so fast that it wasn’t until late 2005, when we got a request from NSW SQT (after they had gone through the end user course) to certify a group of their cadre as instructors in the CFS program, that I understood just how important the work we were doing really was. Of course, there were some miss-steps along the way and some things that didn’t prove to be useful during the experimentation, and I also had to let go of many assumptions and concepts that I had trusted. One thing that I found out quickly was that this process was about the students. If couldn’t be about what I did or could do… and the fundamental concepts & drills had to apply to all students, not just the best or the worst. I certainly didn’t have all the answers when I started and I didn’t come to the conclusions on my own while sitting at a desk trying to re-invent the wheel. Ultimately, the program was developed with the help of some outstanding instructors who were not afraid to take everything that they had learned, turn it sideways, shake it, mix in a ton of new information, throw away a lot of what they had previously believed and trust in the evidence that we were getting back from our observations and experiments. CFS owes much of its existence to Brad Schuppan (NRA & Law Enforcement), Jeremiah Miles (NSW) and John Brown (NSW) who worked with me at VTC. (In fact, there is a great Essay from Brad in the archives of the Valhalla Newsletter from the era I am discussing here.) The guys inside the elite military units who weren’t afraid to look outside the box for training and the leaders in civilian law enforcement, like Sheriff Bill Masters (San Miguel County, CO) who were ready to change the status quo were also important to CFS development. Ultimately, a huge chunk of appreciation needs to go to Tom Forman for letting us re-work, re-build, re-purpose and basically have our way with his creation: The laboratory that was Valhalla Training Center.